Hey there! 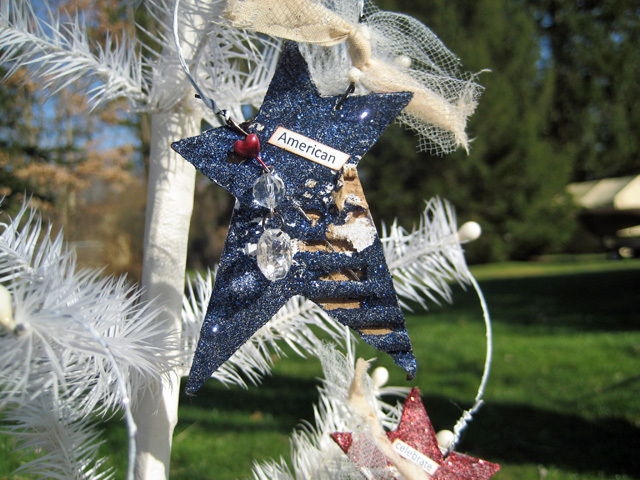 It’s been a crazy week or so around here – more about that next time; today I want to show you these adorable little glittered ornaments I made using cardboard, Art Glitter and Xyron! 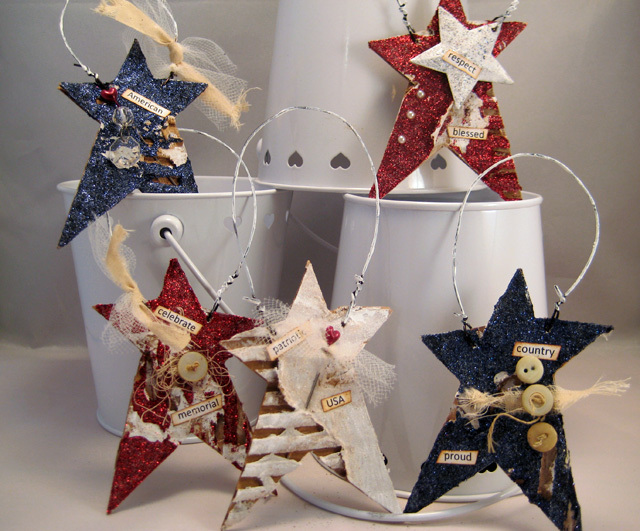 I just couldn’t get my senses into Christmas mode so opted to make Patriotic ornaments that can be displayed from Memorial Day, which is right around the corner, through the Fourth of July. I was actually inspired by the events that took place recently in Boston. I wanted to somehow pay homage to those who worked so hard to bring the criminals to justice and to all those citizens who pulled together to help each other during the tragic events and I’ll think about how we all pull together in time of crisis each time I look at these. 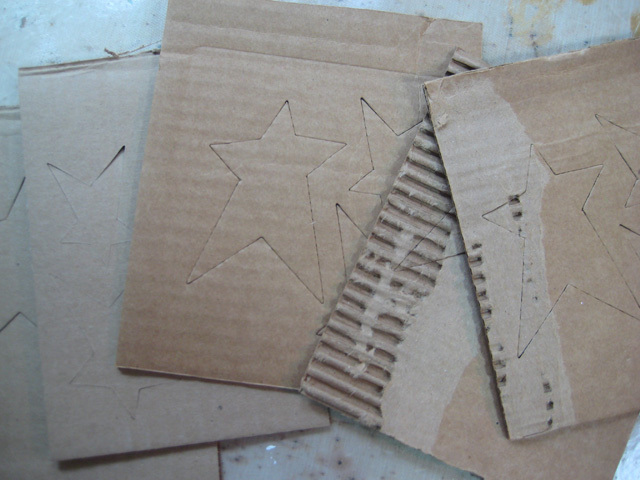 I cut the hearts from corrugated cardboard using the Sizzix Stars, Primitive die on my Vagabond die cutting machine. After punching them all out I spritz them with water to make it easier to rough them up a bit. I just use my fingernails for this or a pick or piercing tool work too. I use a heat tool to dry them before finger painting them with Claudine Hellmuth Gesso to provide a nice white background for the glitters. 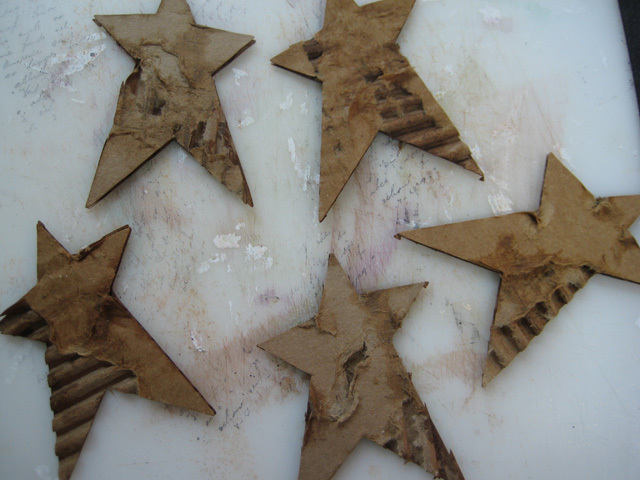 The gesso can also be quick-dried with a heat tool. 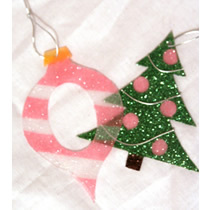 To easily coat these pieces with glitter I run them through my Xyron 5″ Creative Station using re-positional adhesive. I put them in face-down so the adhesive goes on the side with the gesso. I peel the cellophane backing off and discard. Because I do not want a good solid coverage on these (other wise they won’t look distressed!) I quickly peel the stars off the Xyron adhesive strip so some of the adhesive strings and comes off. I love this technique – it just cannot be perfected any other way. I find that just quickly peeling them off always gives me the kind of coverage I want for this technique. Then, the fun begins! I lay them on a creased piece of office paper and sprinkle them with beautiful shades of Art Glitter that stick very nicely to the Xyron adhesive. 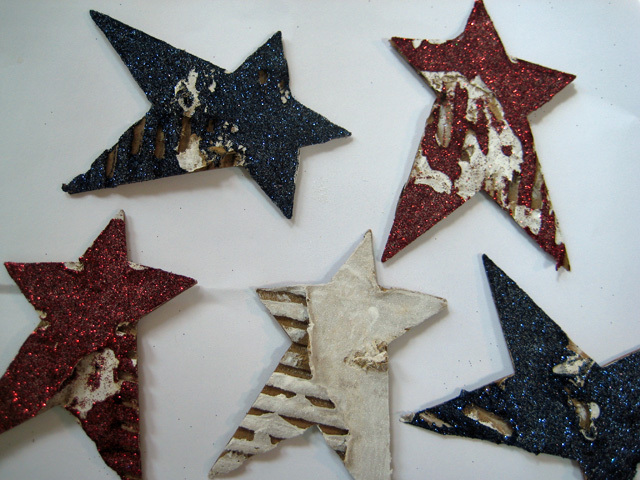 For the patriotic look here, I used Art Glitter No. 27 Navy Ultrafine Opaque, No. 500 Ruby Red Microfine Opaque and No. 533 Mini Pearl Microfine Pearlescent. 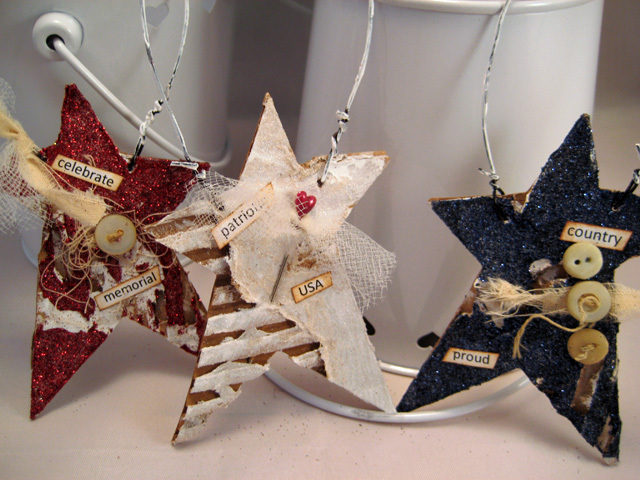 I just love the way the Xyron adhesive has pulled away from the body of the star so the beautiful Art Glitter colors coat the stars in a random, vintage style exposing some of the gesso and corrugated parts. 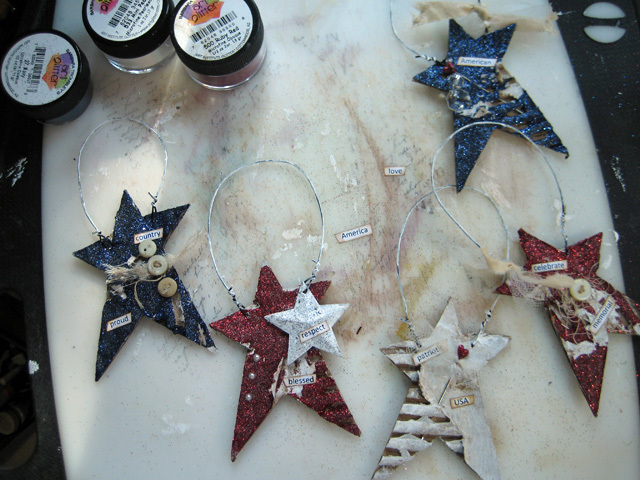 Once the glitter is in place I pierced holes on each side of the stars to attach wire for hanging. I tied some tulle and scrap muslin around some and left the others plain. I printed a few patriotic words to adhere to the stars using my Xyron 1.5″ Create-a-Sticker with permanent adhesive, lightly inked the edges and stuck them down. I added a few embellies here and there: buttons, threads, clear beads, stick pins and an old rusty star that I treated with gesso, Art Glitter No. 533 Mini Pearl Microfine Pearlescent and then just a light sprinkle of the Art Glitter No. 27 Navy Ultrafine Opaque. I’m happy with the way they turned out and I’m going to enjoy seeing them hanging here-and-there around the house. These are so easy and quick to create – have a go! To see other great projects from my Xyron and Art Glitter design team members, please click on the links to visit our blogs and enjoy! Thank you, Vivian. 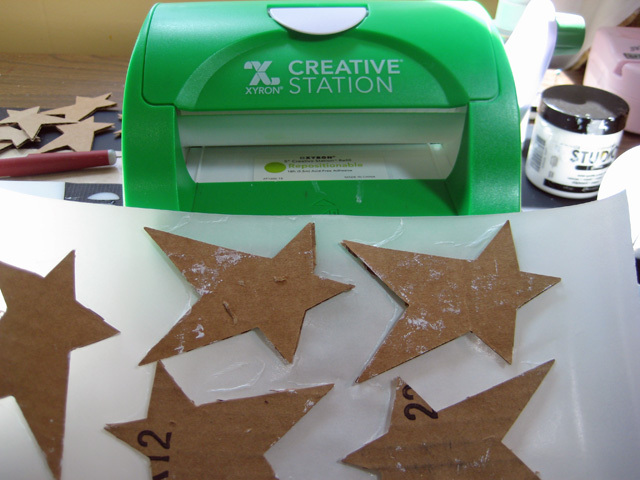 I can cut and send you the cardboard stars if you like! Great Red and Blue Glitter!!!! I love these- perfect as always! Thank you, Jan. Yes, that Navy and Ruby Red from Art Glitter is fantastic coloring. Enjyed your post and how much I enjoyed your class and looking forward to your next class. Thank you so much, Ivy! I enjoy teaching classes. I like the basis of an ecological class devoted to the use of found objects to complete unique books. Thanks, Sandy. I’ll see what I can do! Thanks, Robin. 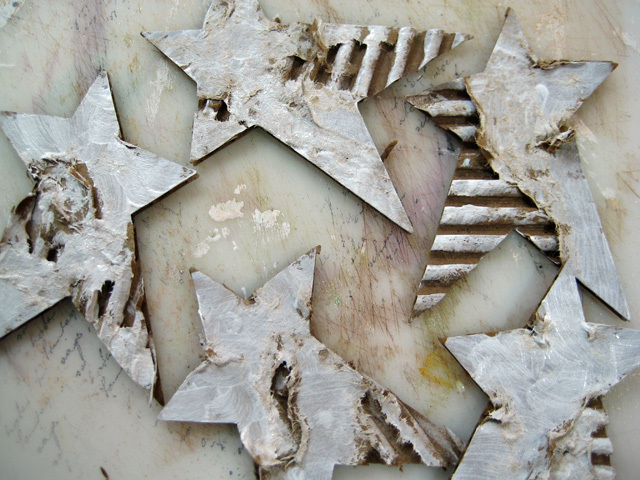 I love using the Primitive Heart die so much and I think I will enjoy these Primitive Stars just as much!